The UUM-44 Subroc was the first and only submarine-launched long-range nuclear armed anti-submarine missile ever deployed by the U.S. Navy. In the early 1950s, sonar technology had advanced to such a level, that the detection range of submarines became larger than the range of contemporary torpedoes. Various studies discussed nuclear-armed submarine-to-submarine missiles to give U.S. attack subs an engagement range matching its detection range. 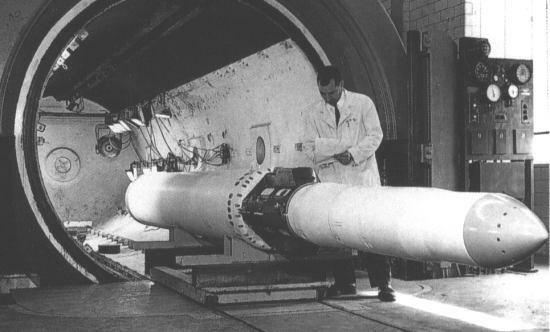 Finally, in June 1958, the NOL (Naval Ordnance Laboratory) White Oak began the development of a solid-rocket powered underwater-air-underwater missile. 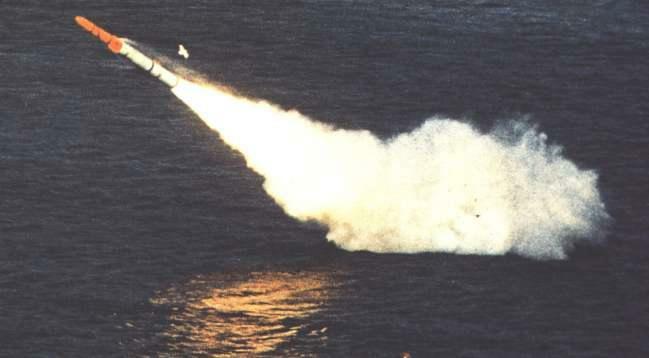 The new missile was designated Subroc ("Submarine Rocket") MK 28 (no Navy-style missile designation, like e.g. UUM-N-1, was assigned). Early in the program, Goodyear Aerospace was selected as prime contractor for system integration and production. The first test launch of a Subroc prototype occurred in August 1959, but numerous technical problems delayed the program. The Subroc was launched form torpedo tubes, which had to be filled with water before launch. The cold sea water chilled the solid fuel, which lead to inefficient missile propulsion. The creation of air bubbles during the initial underwater passage of the missile could prevent motor ignition or interfere with the guidance system. Finally, all missile systems, including the inertial system and the nuclear warhead, had to withstand the extreme mechanical forces on the missile during water exit and reentry. These problems where not solved until 1965, when the UUM-44A Subroc (so designated in June 1963) became operational on the USS Permit (SSN-594). Apart from the Permit class, SSNs of the Sturgeon (SSN-637) and Los Angeles (SSN-688) classes were also equipped with Subroc. The typical SSN load of Subrocs was 4 to 6 UUM-44A missiles. The UUM-44A was launched horizontally from standard 53.3 cm (21 in) torpedo tubes. After travelling a few seconds to a safe distance from the SSN, the Thiokol TE-260G solid-fuel rocket motor ignited. The missile was controlled both under water and in the air by four jet deflectors in the rocket exhaust. Once it had cleared the water, the Subroc quickly accelerated to supersonic speed. The Kearfott SD-510 inertial guidance system directed the UUM-44A towards the predetermined target location. Information about this location was provided to the missile before launch by the SSN's MK 113 fire control system, which used information obtained by the Raytheon AN/BQQ-2 sonar system. At some precalculated point of the trajectory, the motor section was separated from the warhead section by explosive bolts. The guidance system actively controlled the missile until water reentry, using small aerodynamic surfaces on the warhead. Unter water, the missile would sink to a predetermined depth, and detonate the W-55 nuclear warhead with a lethal radius of about 8 km (5 miles). The yield of the W-55 is given by different sources as either low kiloton (1-5 kT) or 250 kT, but the latter value seems to be the true nominal yield. An enemy submarine, which was detected and located by an SSN, had virtually no chance to escape a Subroc, especially since its sonar could not detect the missile in the air. About 300 UUM-44A missiles were produced by Goodyear between 1965 and 1972. In the late 1970s, an upgrade program for Subroc was planned, which was to equip the missile with a new digital guidance system and a regrained rocket motor. However, this program was initially cancelled, because funding went instead to the development of the intended successor, the UUM-125A Sea Lance. When the UUM-125 program was delayed, the Subroc upgrade plan was finally implemented in 1983. The end of the Cold War in 1989 signalled the end of the old Subroc as well. Between 1989 and 1992, all UUM-44A missiles and their nuclear warheads were removed form the U.S. Navy's inventory. Originally, it was planned to replace them with the non-nuclear UUM-125B Sea Lance, but the whole Sea Lance program was cancelled in 1990, too. U.S. Navy attack submarines have currently no very long range stand-off offensive capability.